Hello from the our family: David, Cindy, Zachary, and Nathan. Born in California in April 2003, Zachary has Glutaric Acidemia Type 1 (GA1), which was diagnosed after a neurologic crisis in infancy. He has severe brain damage typical of this disorder, meaning his motor skills are devastated and he has dystonia affecting his whole body. He is a smart little monkey, with a sense of humor and an infectious grin. Our story was first made public as part of the newborn screening movement. Zachary was featured on the front page of the Wall Street Journal, on ABC’s Evening News, and in several local newspaper and magazine articles. Most importantly, he was one half of the “two Zacharys” story which was started by Mike Waldholz at Wall Street Journal, and used by the March of Dimes in California to hammer home the need for comprehensive newborn screening legislation. In this way, we joined the rising tide of the NBS movement and rode the crest of that wave to success in California’s legislature. Zachary is also a twin. Brother Nathan is not affected by GA1, although he is a carrier like Mom and Dad. Nathan is also a funny, smart, quirky kid who is a great model for Zachary. The boys interact like brothers do. Nathan will graciously offer his brother up for something he himself doesn’t want to do, such as: “Nathan, it’s time for your haircut!” “No Mommy, Zachary can go first…” This happens a lot, but don’t worry, Zachary gives as good as he gets. I remember when the boys were about three, and they were getting into their car seats. Zachary would wait until Mom was distracted, and then he would cry and look accusingly at Nathan, which was a double whammy of getting Nathan in trouble and getting comfort from Mom. I’m sorry to say I fell for that more than once before figuring it out. Zachary is generally a healthy kid, and now sees his metabolic geneticist and neurologist once a year (and at any hospital visits). Medically, we have been fortunate to have had only a few hospitalizations beyond his initial crisis, the longest of which was two weeks. Zachary’s hospital stays usually involve whatever cold or virus is making the rounds at school. We have it down to a science now—David and I have an overlapping system of 30-hour shifts that allow us to have 24-hour coverage for Zachary in the hospital as well as both of us available when the doctors do their rounds. We have found it essential to be prepared with the emergency protocol. We also use tricks like getting admitted through the pediatric ER and knocking out as many tests as we can while there (like the head CT he always needs due to shunt), bringing Zachary’s food from home, and once “on the floor”, getting things (tests, orders, procedures) done well before day shift leaves. One mark of his progress is that Zachary no longer needs any “heavy duty” medications. 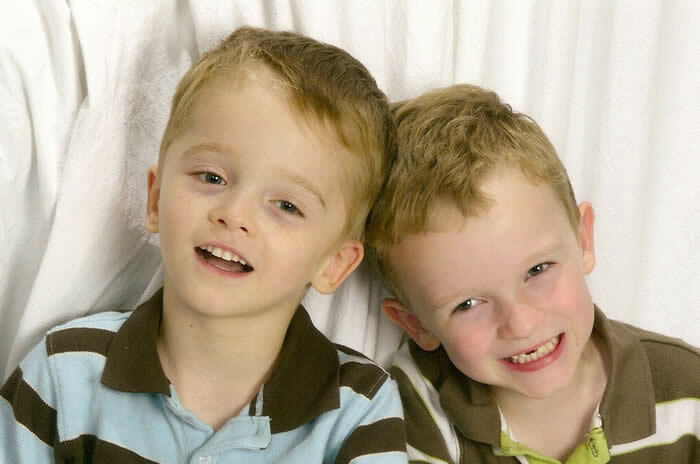 When we first came home after his crisis in December 2003, Zachary took 25 doses of medicine every 24 hours. Now, almost five years later, he takes one, sometimes two (just Carnitine, and occasionally something for reflux). He also has a lot less vomiting. Again, when we first came home in December 2003, Zachary spit up or vomited every day, often several times. Over time it became cyclical—I charted it on the calendar, and like clockwork every two weeks we would start another 7 – 10 days of throwing up. After about 18 months, we actually burned out our little steam cleaner! Then, slowly, the cycles started to stretch out. The biggest difference came from moving away from formula onto a grain based diet. That’s when we started burning out the blender instead J We were able to stop the overnight feedings, as he could handle enough calories during the day using the heavier food. Now we have a Vitamix blender, and it can handle Zachary’s diet easily. So if he is vomiting, it’s a clear sign that something is wrong and we get right on it. In addition to the diet change, I also credit Zachary’s movement lessons with much of his progress. Zachary has been doing PT and OT since infancy, and continues these services through school. But the real changes came when we brought in some new modalities. In just over a year, he’s gone from constantly extending, unable to sit comfortably in a wheelchair (or anywhere else); unable to consistently relax his body, supports his head, or use his arms, to a child who is able to be peaceful in his own skin. He’s started rolling from back to belly, and has greatly improved head and trunk control. He’s not spastic all the time, and is sleeping better. He started taking lessons with two Anat Baniel Method practitioners last July, and is a happier, more comfortable kid because of it. In the last couple of months, we’ve also incorporated Masgutova Method reflex integration work into Zachary’s program, and that shows great promise as well. One area where we’re really having some fun is family recreation. For our vacation this summer, we rented a Landeez beach wheelchair for the week from Shared Adventures, a non-profit in Santa Cruz. Since Zachary is still child-sized and the chair wasn’t, we just strapped a car seat in place and off we went. We learned the car seat trick while figuring out a way to get Zachary into a bike trailer. We got a Wike special needs trailer this year, and the bench seating really didn’t work well for Zachary because he needs more trunk and head support while riding. So we picked up a cheap car seat and secured that into the trailer. It worked like a charm, and “wiking” has turned into one of Zachary’s favorite things to do. Zachary has a special needs stroller, which we use for outings in the community. Not great for positioning, but good for getting around. We’ve also realized the benefit of taking Zachary on carnival rides while he’s still small enough for us to hold (at 44 inches and 41 pounds, that might not be too long!) He absolutely loves all things vestibular, and the faster, the better. Zachary is quite a daredevil! These days, our biggest challenge is education. Finding the right environment for Zachary has proved difficult enough that our IEP team has brought in the Diagnostic Center of Northern California, part of the state Department of Education. Zachary is on his third school in as many years, and it’s still not “appropriate.” Everything is a trade-off. For example, Zachary is non-verbal, so he needs to have an augmentative communication (AAC) system in place before mainstreaming will be successful. This year Zachary has a great teacher who is not flustered by assistive technology, but she doesn’t know how to choose the right tools for Zachary and depends on the AT specialist (who is little help). Also, in this school, he has lost his typical peers. So he’s getting some of the technology support he needs, but missing out on the social piece which is also so important. So, we keep plugging away and pulling in whatever resources we can. It’s going to be a long haul, but we’re committed. We fully expect Zachary to graduate high school and go on to college in the future. Over the last five years, we have developed a deep appreciation for the disabled community. If not for those who worked on ADA, IDEA, the Tech Act, and other legislation, Zachary would not have the opportunities he does today and our family might not have the support that we depend on. It amazes me that personally; I was completely unaware of this community until my family became a part of it. From legislative advocacy to medical and therapeutic services, from educators to social workers, from social and recreational organizations to sympathetic shoulders to cry on, I am so grateful for the people we’ve met along the way. People with disabilities, and especially children with disabilities, continue to inspire us at every turn. Our family’s goal is to pass it along and touch other lives in a positive way, as ours have been touched by so many. Many thanks to Kathy Stagni for allowing us to share our story here. Long days and pleasant nights to you, and God bless.